Carol and I would like to thanks all the members for the support they have given us this year, it has been a great honour to serve as your Captain. 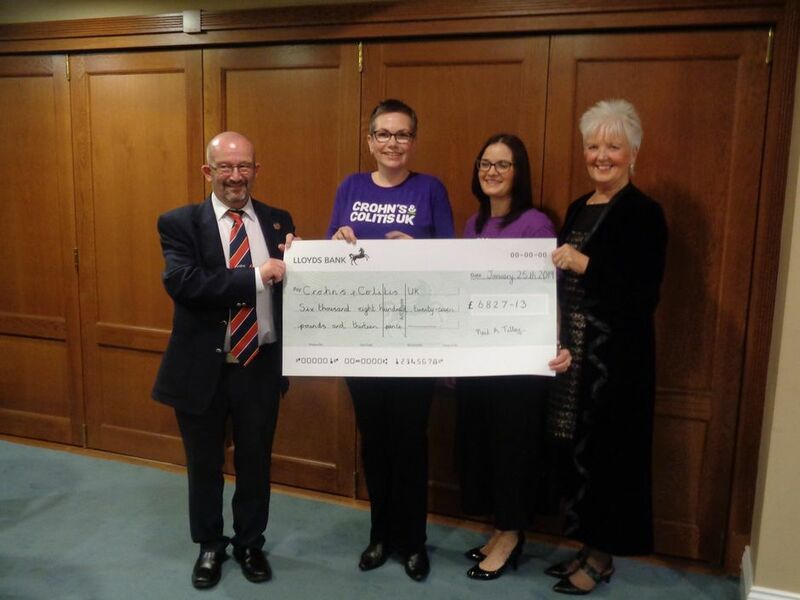 The generosity of the members has realised a sum of £6827.13 toward our charity Crohn's and Colitis UK. You are invited to blind bid for a magnificent limited print of a painting crafted by Mark A. Frost, a long serving member of the club. The painting have been created to celebrate the signing of the Armistice on the 11th November 1918. 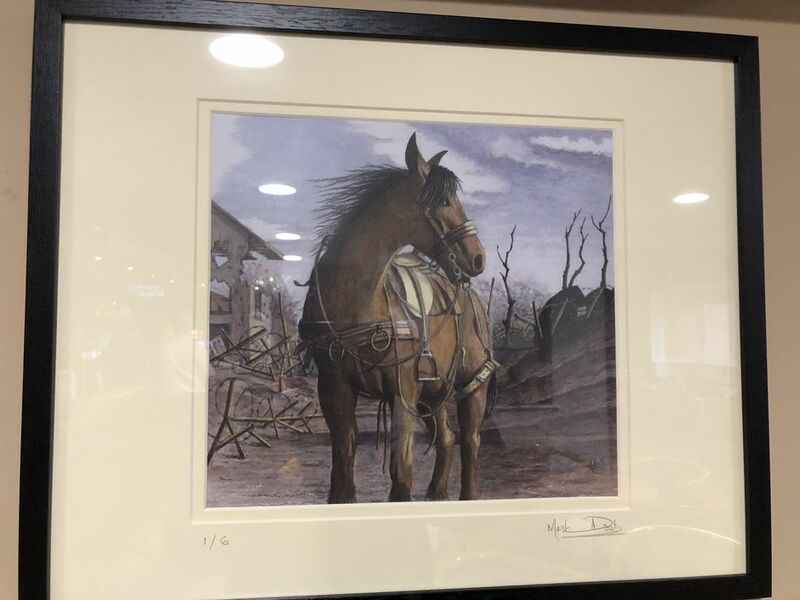 The winning bid will be announced at the Captain's farewell dinner on the 25th January, the print can be viewed above the competition touch screen in the clubhouse. Many thanks Mark, this is a special painting. 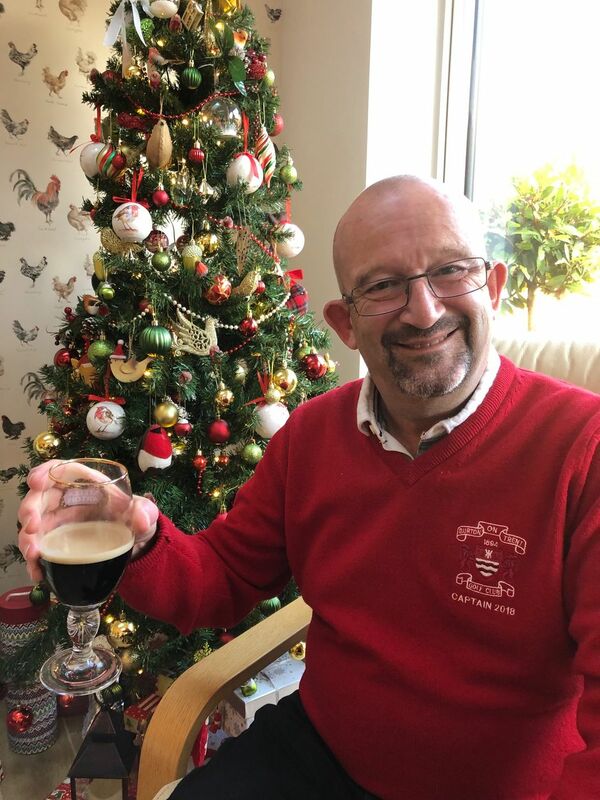 Carol and myself would like to wish all at Burton Golf Club a very Merry Christmas and a Happy New Year. Many thanks for all your support and good wishes. A resounding win for the Staff in the annual Staff v Directors match 3 -1. 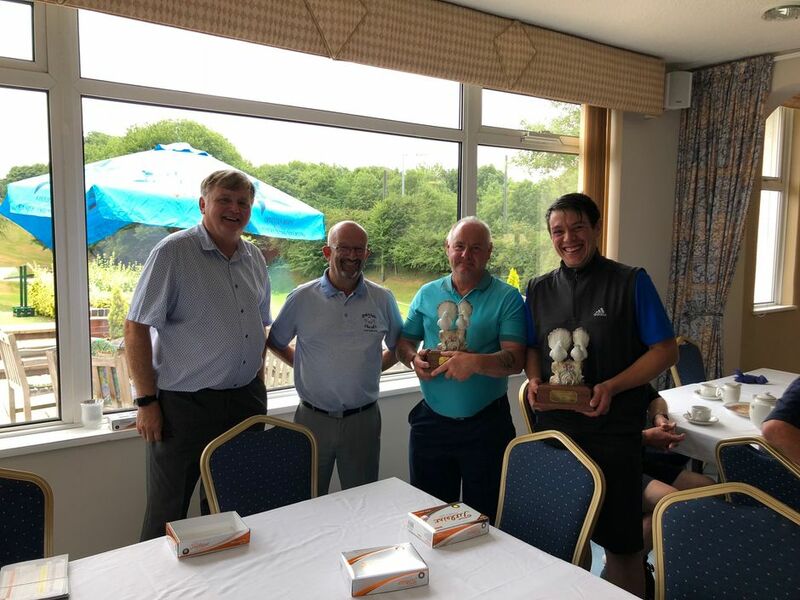 The result was helped somewhat by a game devised by Gary in which the staff played their best ball in a texas scramble and they nominated which ball the directors should take!!! PLUS a shot per hole!!! Can't believe we agreed to it. Anyway congratulation to the Staff and many thanks for all you have done this year. .Ladies Brandy Stableford winter sunshine mince pies and mulled wine what more could you want.. 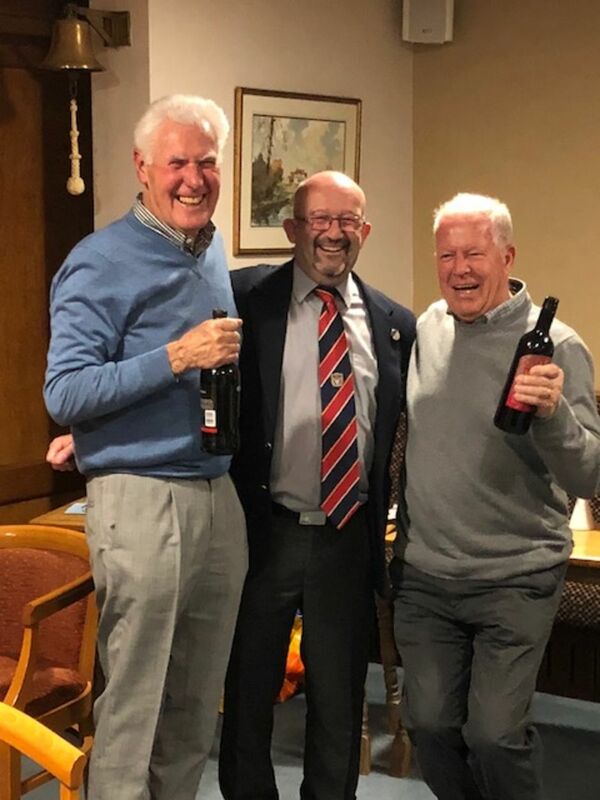 The final of the Winter Social has taken place with the winners being John Saville and Keith Lovatt, congratulations to both. 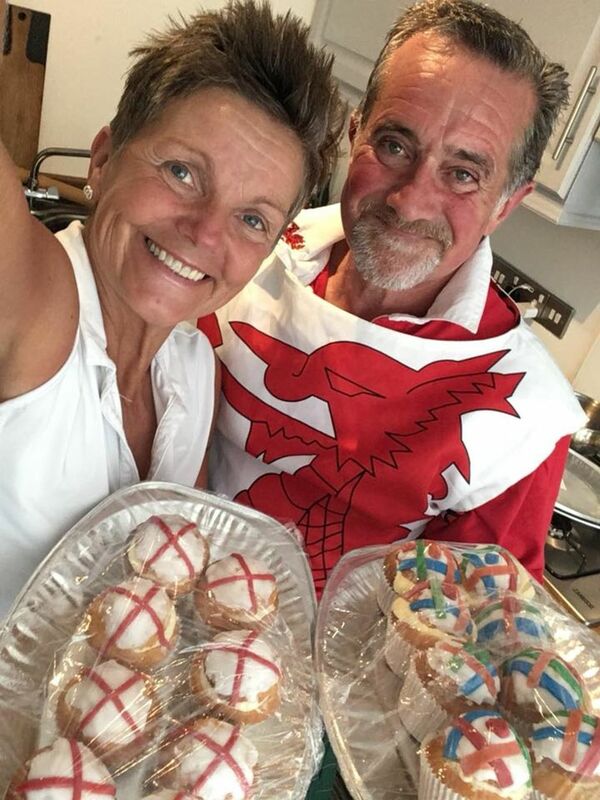 Once again many thanks to Roger and Moira for organising the competiton. Great to see members in the clubhouse. 17/11/18 Fantastic evening with Derek Randall . Thanks to all who placed bids on the four balls, the auction raised £602. Check the photos on the club Facebook site. Well done to all those medal winners 2018. 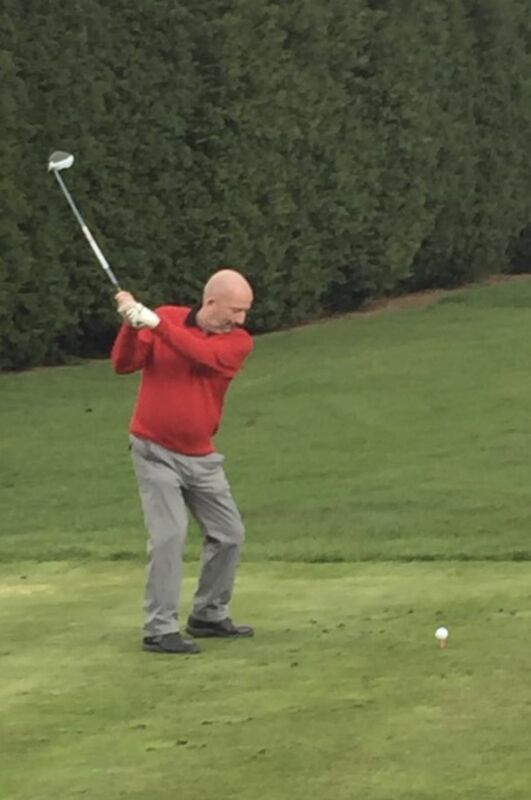 Medals are the ultimate golf challenge and need focus and concentration. Many comment on how tough medals are but we still manage to fill all 14 medal competitions. See if you can guess why I chose these photos to print on my webpage!!!! The rest can be viewed on the club's facebook page . We have three Christmas hampers to raffle off for the Captain's Charity. 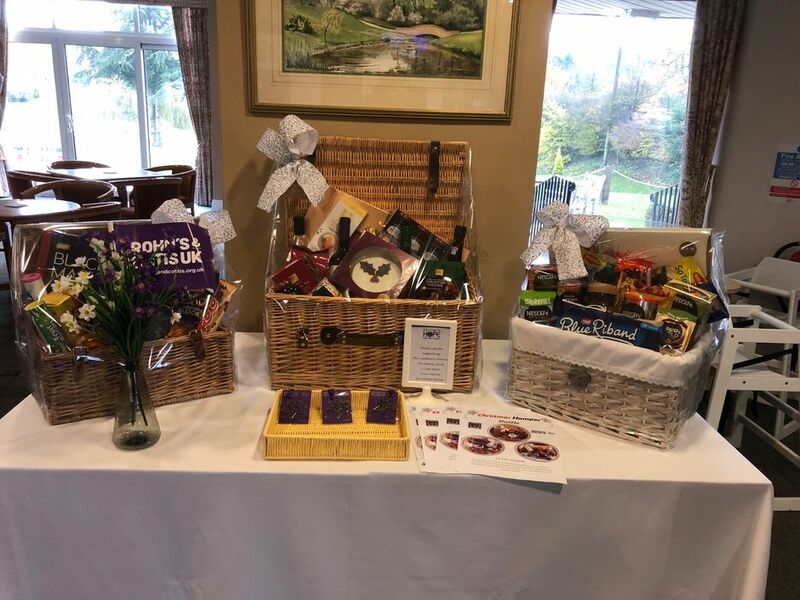 There are no raffle tickets so if you wish to have a go at winning one of these hampers please put your name on the board behind the bar, £1 per square. Many thanks to our Lady Captain Carol and Mike for putting the hampers together. 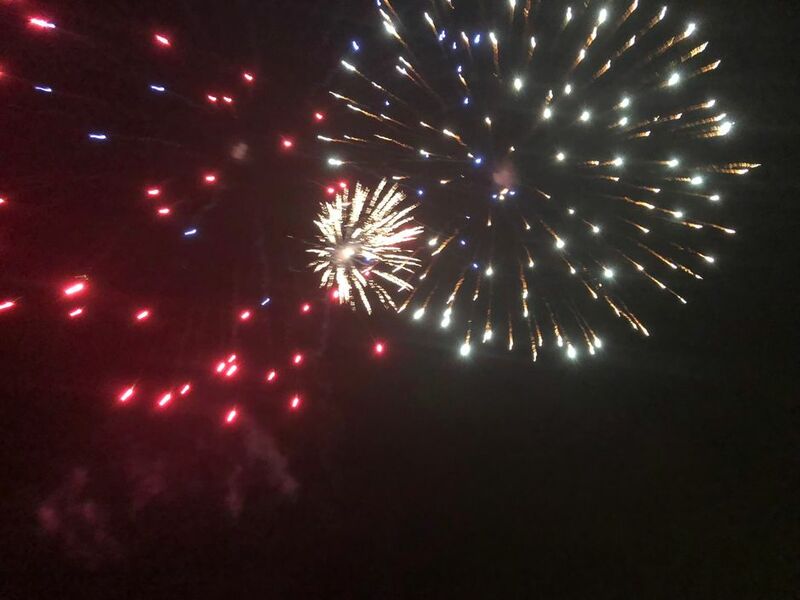 Many thanks to all those who helped organise the Frieworks night, once again it was a great success. 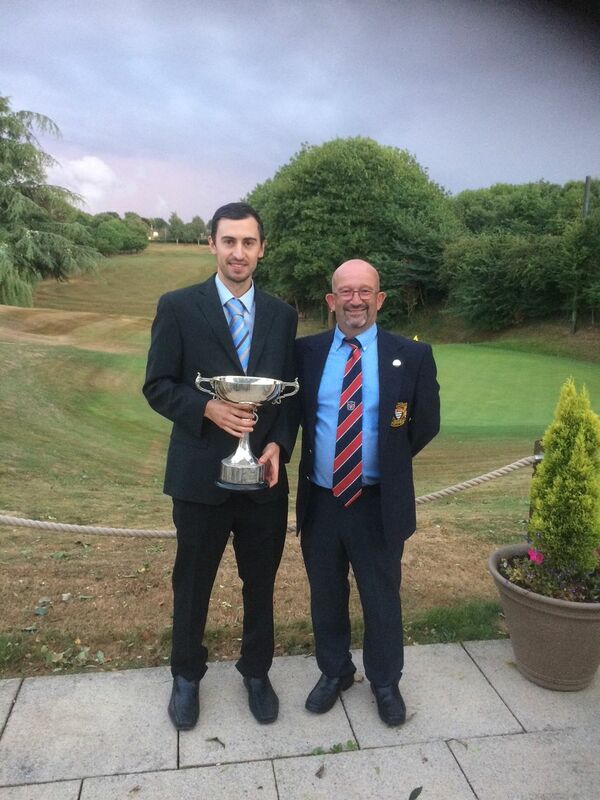 Many Congratulation to David Kerr-Delworth the new Derbyshire County match play champion. See news for more details. Winners of the KS Wright competition Gina Taylor and Vin Moran. Many thanks to all those who supported the competition and especially to Tony Barkway and Dave Salter for adminstering the results. There were also contributions from Phil Riley, Gerri Ellam, Paul Ellam and Bob Morris. 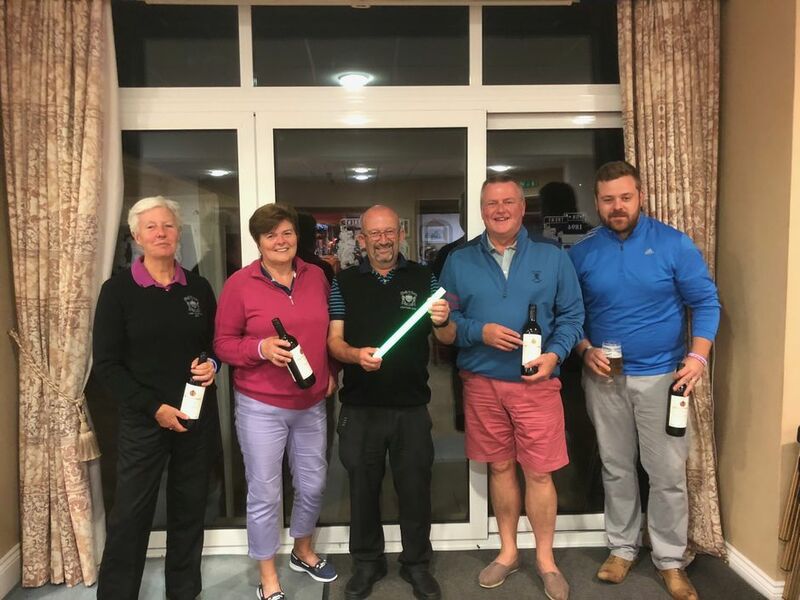 Many thanks to the team who played against Newcaslte GC, we managed to win back the commemorative barrel, the winning margin was close, 4-3 in our favour. Triumphant Derbyshire UI16 league champions, including our own Tom Weeks. 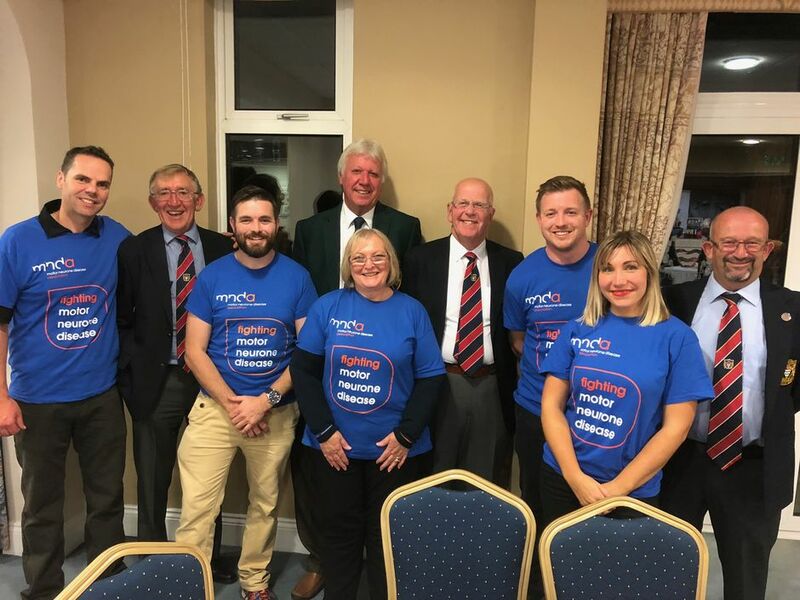 BGC's winning team in the Motor Neurone Disease charity day. A great event, well organised. Keep an eye out for it next year, it is well worth supporting. Kim Peacock Vice Captain, Debbie Kennedy and Jane Horobin were the winners in a Texas Scramble played in the Captains away day at Ruddington Grange. 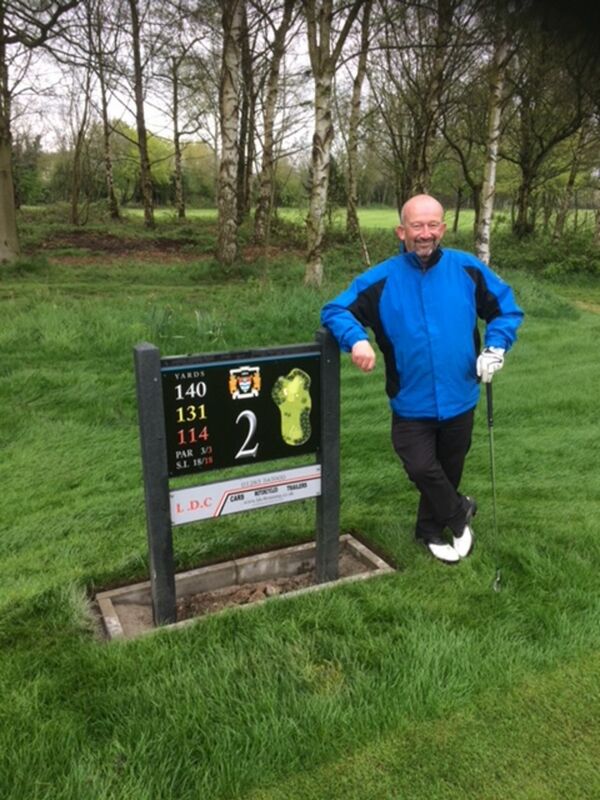 The day started very wet, but all enjoyed the course and the sun came out eventually. 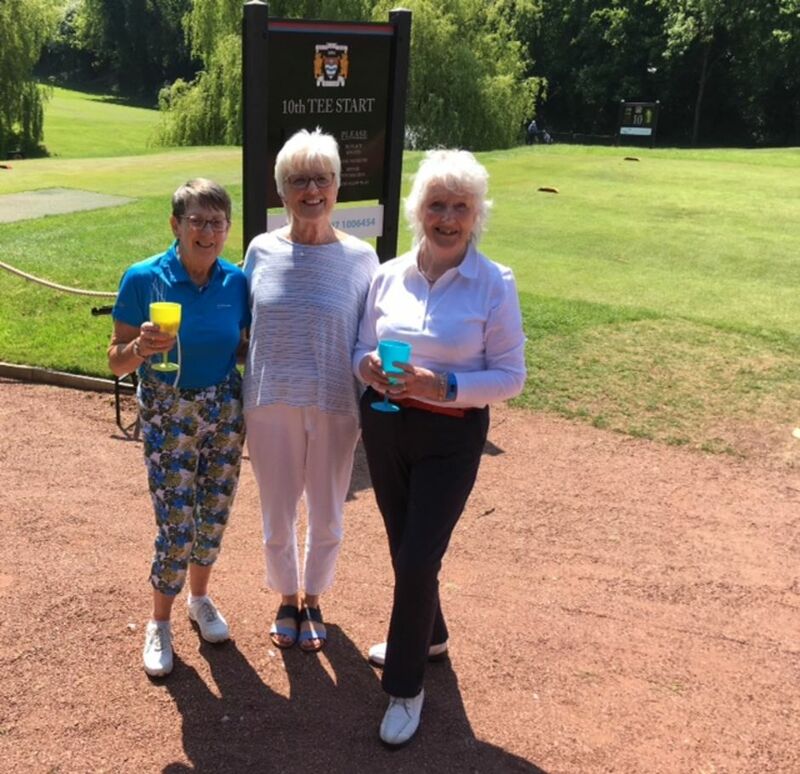 Thank you to the ladies who joined in the day also thank you to Ian Gelsthorpe the professional who was very helpful arranging the day for us. 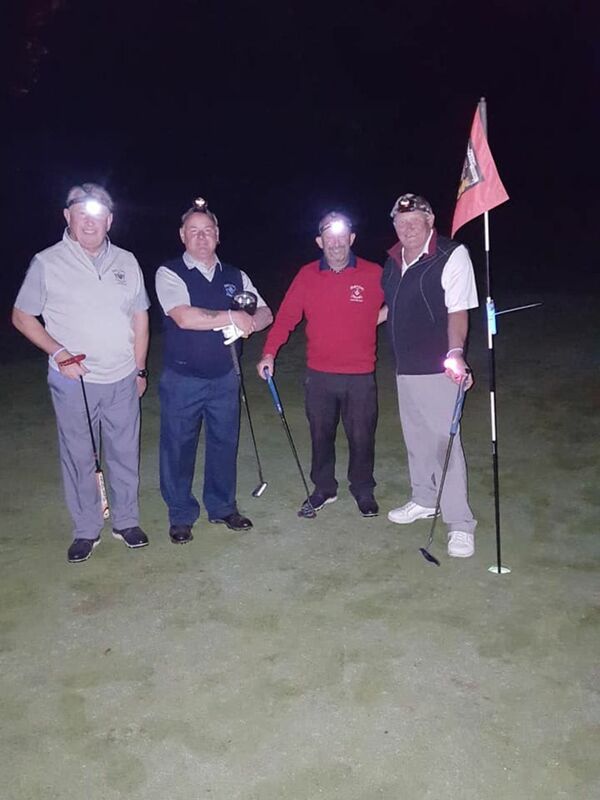 31/8/18 Many thanks to all who helped to make the night Golf a success, it was an interesting night and lots of fun. Winners were Gerrie Ellam, Dan Pickering, Anita Chamberlain and Ivor Chamberlain. Once again the long standing tradition of victory to the Captain was maintained. Scoring methods for this competion have varied over time but this year match play scores sufficed with the Captain winning 4 1/2 to 1 1/2. Many thanks to the club members who supported this event, it was a great day enjoyed by all. Keep an eye out for the Celt v English which also promises to be a fantastic event. Debra Eaglefield and Anita Chamberlain after a hard fought match in their Daily mail 4somes lost their match too The Rugby ladies in the 6th round. The Rugby ladies having the advantage of playing at their own course. Well done to them both getting so far in the competition. 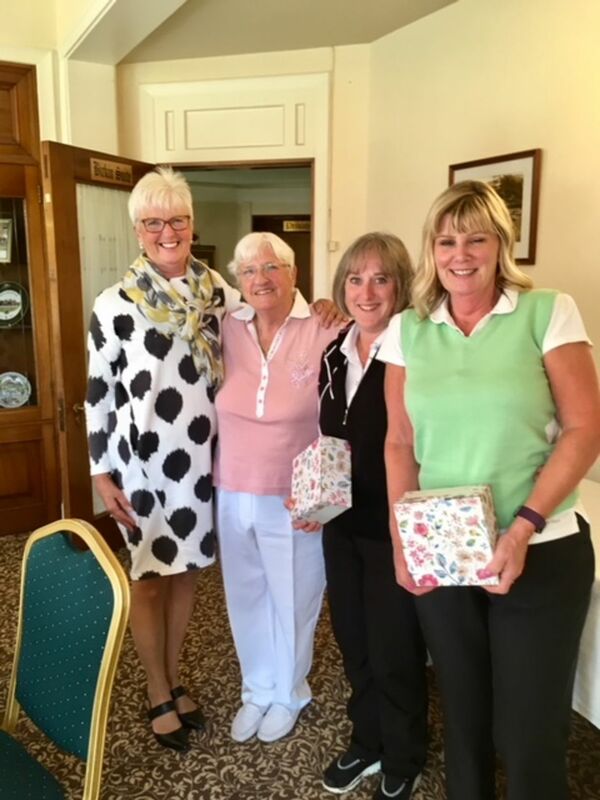 Gaynor Jenks and Claire Stannway played in the area finals of the Coronation 4somes Stableford. They both enjoyed the experience against Brampton Park, playing at Lutterworth Golf Club. Brampton Park won on the day. Again well done to both ladies for reaching the semi finals. Well done to Mark Parker Club Champion 2018. This is Mark's 3rd consecutive championship and his 5th in all, one behind Fred Summers, in all time number of wins. Mark shot an amazing 71 in the first round when the wind was at it's height and 79 in the second round when it also rained heavily. Alexie Glass was second 2 shots behind with James Weeks 3rd, 3 shots further back. Alexie also won the best net score shooting a magnificent 72/70 with Colin Rigby winning Division Two with 74/73. Gina Taylor won the best net with a superb 68. The Entry sheets for Captain v Vice Captain are now in the Men's locker room and the Ladies comps office. Many thanks to those who supported the Flower Arranging evening last Friday, it was well attended and you manged to raise £400 for our Charity. It was very good to see the resurrection of the Early Bird competition. 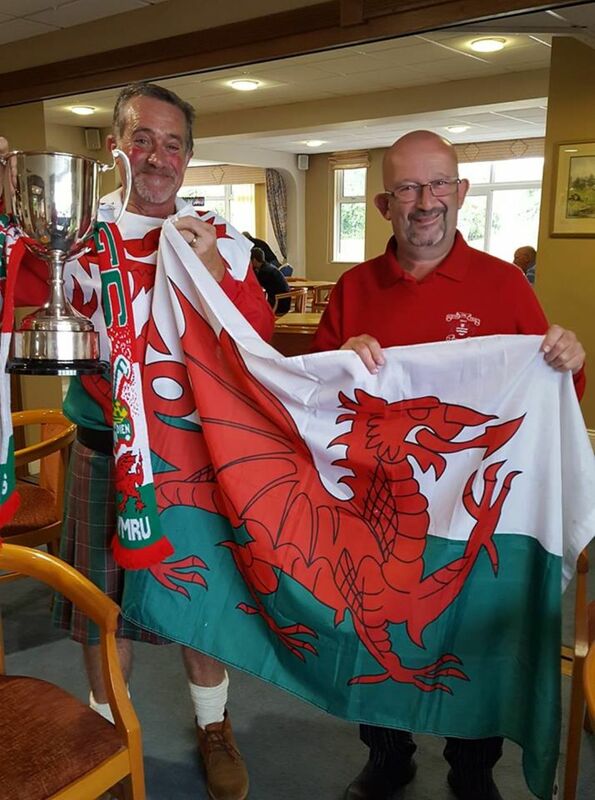 The event was well supported and thanks go to the players who braved the 6.00am start. A hearty breakfast followed and the event was enjoyable and successful. Well done Steve Toombs and Jonny Spark who were clear winners. Please keep your eye out for the Captain v Vice Captain and Celts v English, these are traditional events that need your support. Deborah Eaglesfield and Anita Chamberlain have reached the 6th round of the Daily Mail foursomes. They knocked out Forest Hills yesterday with a 4-3 win. Congratulations to them both. Many thanks for those who attended Captain's away day, it was a great day. Well done to Alan Taylor, Shaun Jenney, Sam Taylor and Andy Horan who won with a mgnificent score of 96 points . 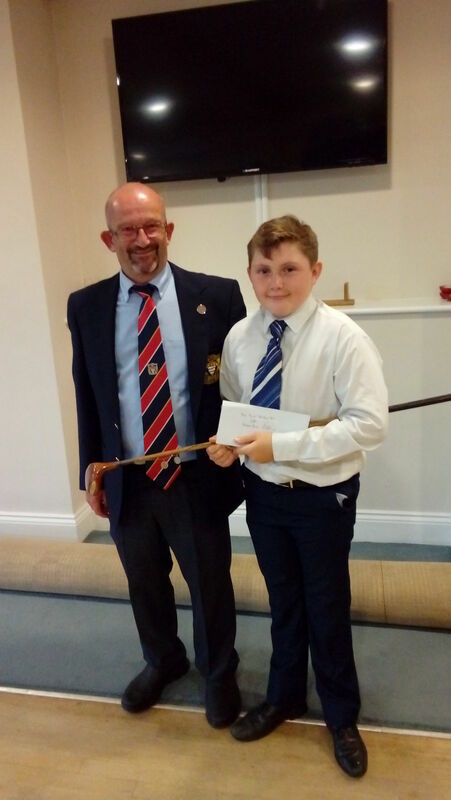 Winner of the Captain's Trophy was Daniel Elson our Junior Captain with a magnificent score of 44 points. Many thanks to players and supporters who participated in my Captain's Day. It was a great day and the generosity of all is been much appreciated. You raised over £2000. Gina Taylor won the ladies division, Kian Moran won the Junior prize and Dave Salter won the Past Captains. More details to follow. A sign-up sheet is now in the Gents Locker room for the away day at Oakmere Park. The cost will be £30 which will include a 2 course meal, round of golf prizes and transport. Please make payment to the club office prior to 9TH July. Unfortunately the coach is now full. 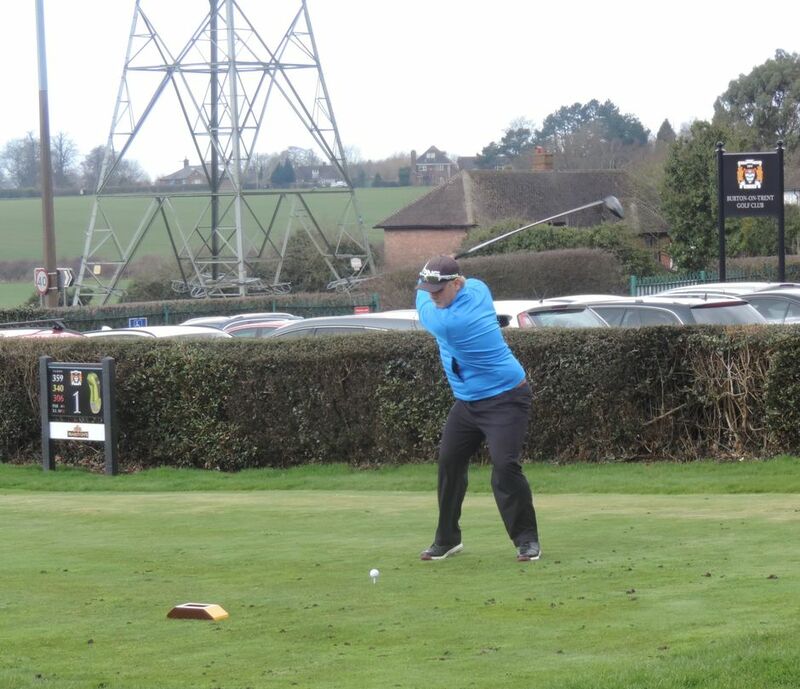 The Four Counties Seniors tournament took place on Monday 11th. 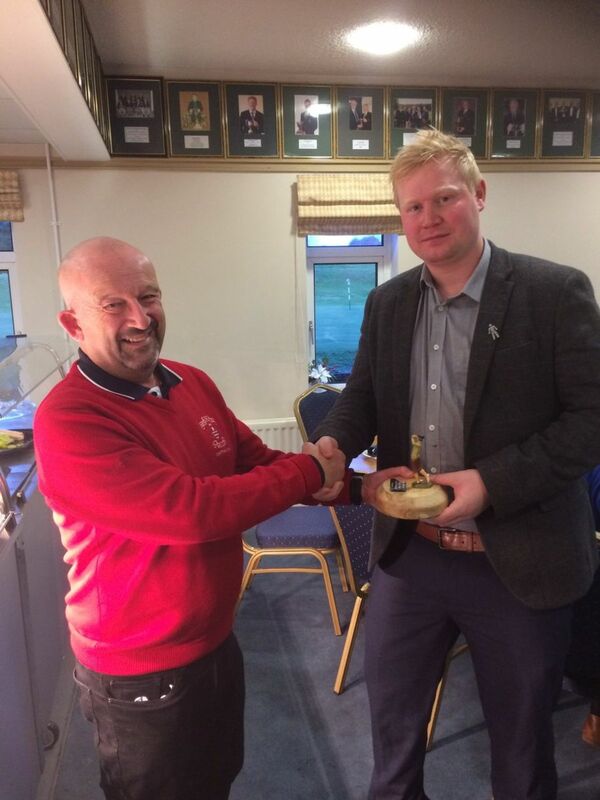 Burton did extremely well sharing the trophy with Walsall Golf Club. We will receive the trophy for 6 months which will nicely tie in with us hosting the event in our quasquicentennial (125th) anniversary year. Thanks to all who played. Fantastic 'Shires' Juniors event took place onSunday 10th June. We pulled out the stops to make this a success, thanks to all concerned. 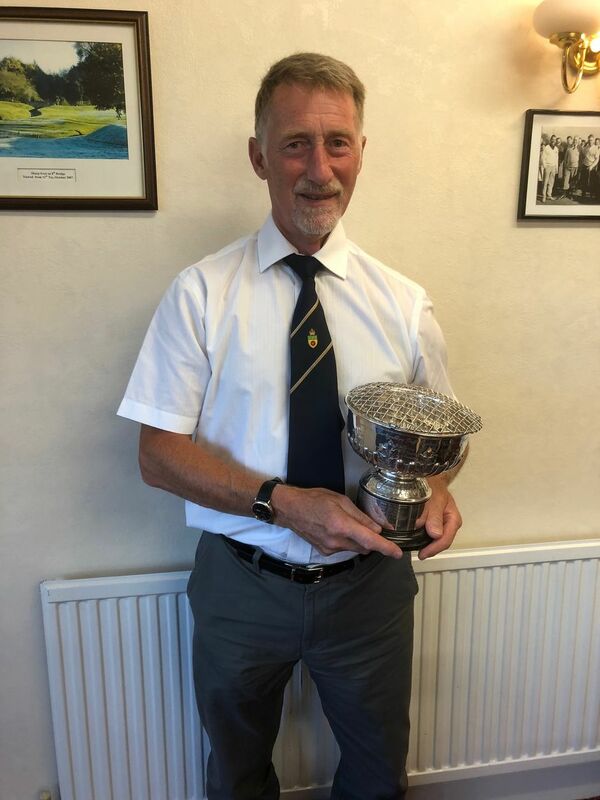 Well done Ernie Watson for winning his division ,Olivia Dixon for best gross score and Darcey Davis for posting best net score all from Burton-On-Trent GC. All our participating juniors did the club proud, well done. 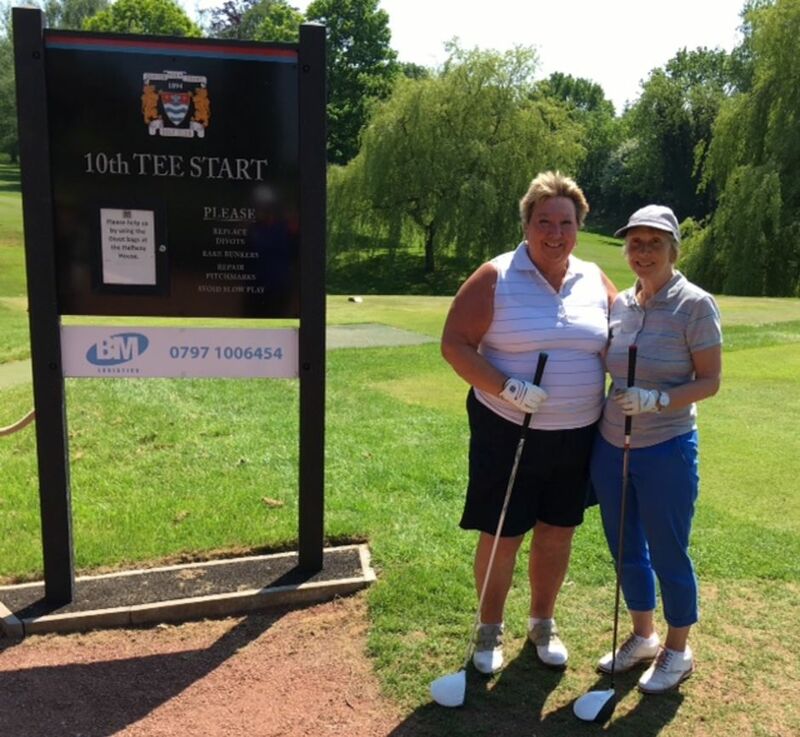 Congratulations to Sue Brunt who scored a hole in one on hole 12, at Hinckley during our Friendly match with their team on Friday 1st June. 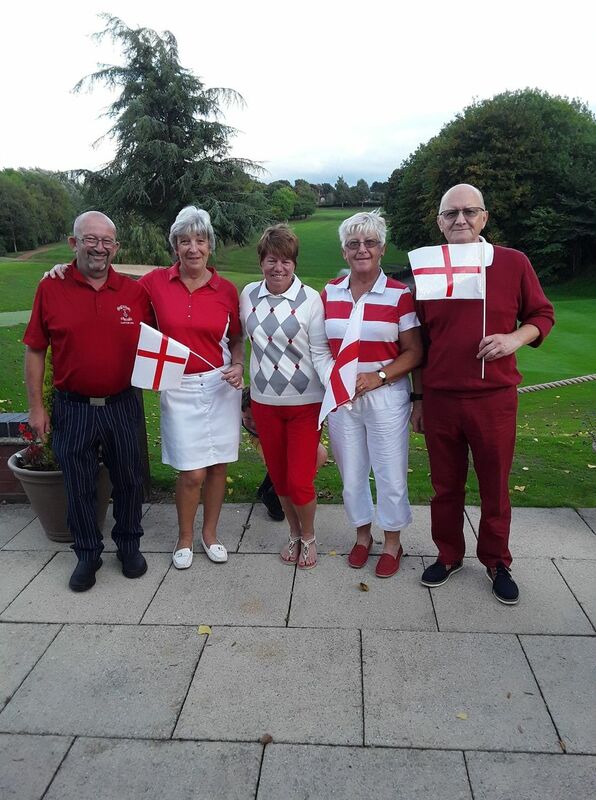 Four Silver division ladies entered the the County amam at Breadsall priory on Tuesday last, and came a brilliant 5th place. The Ladies England Golf Midlands North Region was held at Burton on a beautiful sunny day. There were 90 players all with their own caddies, very serious lady golfers. 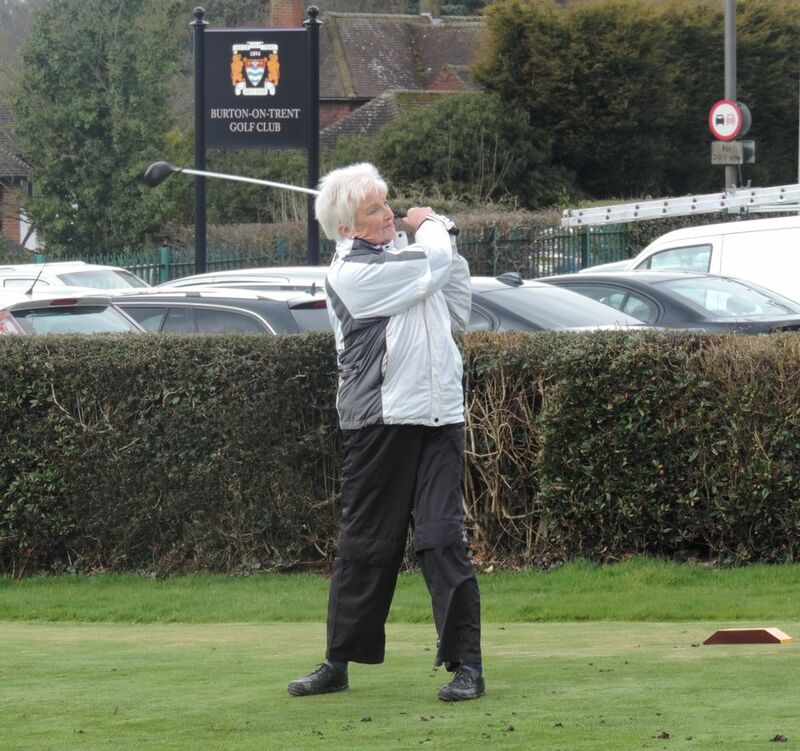 Our own Sue Sloane represented Burton, she is a Bronze player in the ladies section, she came 39th out of 95 which was a tremendous achievement and was very happy with her position in the match. The sun shone and the course was in magnificent condition for the lady Captains Day. 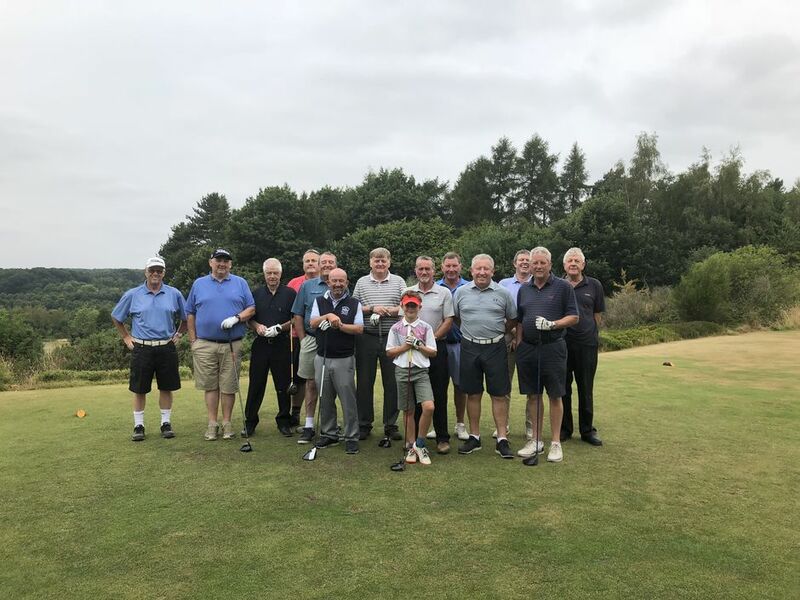 A fun Stapleford and putting competition was organised for 32 players and Pimms and lovely cakes served in the half way house for those who took part. Thank you to all who helped to make the day a fun experience a special thank you to Gary Stafford for arranging the competition. Bill Webber, Dean Mortlock, Darren Lewis, Jan McKinnon, Eileen Wilkinson, Neil Carter, Sandra Hamilton, Martin Taylor, Caroline Salter, Edie Mrriman, Joan Pipes, Geoff Barnett, Phil riley, Mark Greenhalgh, Alan Taylor, Cath Collier, Sue Guildford, Mary Dawkins Smith, Jan Toombs, Nancey, Jack, Sue. There are others who left no name so please check. I visited Oakmere Park Golf Club today to make some final arrangements for our away day on Friday July 13th. The day will include tea/coffee and bacon butty to start, a round of golf and a two course meal to finish. The competition will be am/am with three main prizes plus nearest the pin and longest drive. A message from our Ladies Captain, Carol. 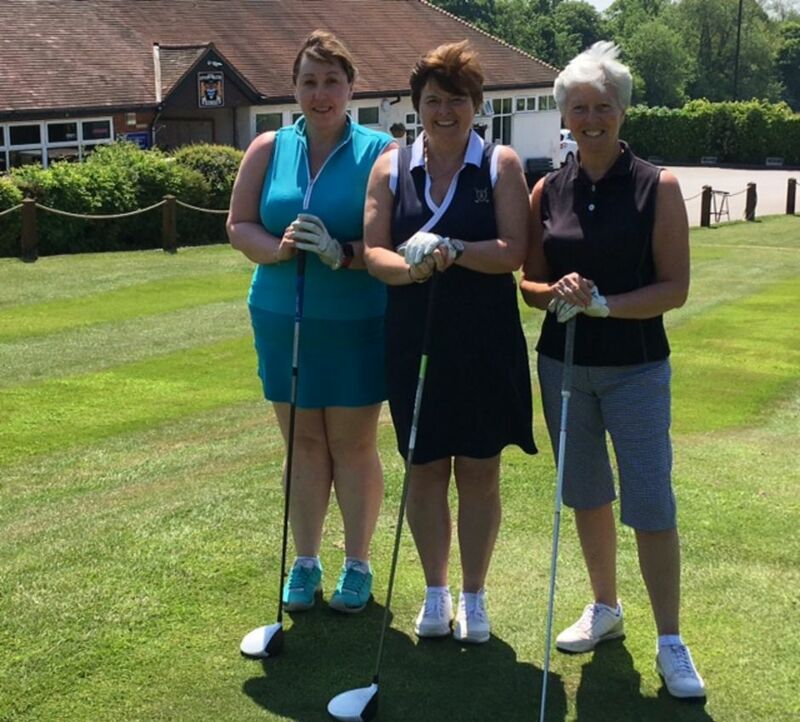 Congratulations to Claire Stanway who had her handicap cut by 3 shots in the recent Ladies Challenge Bowl. 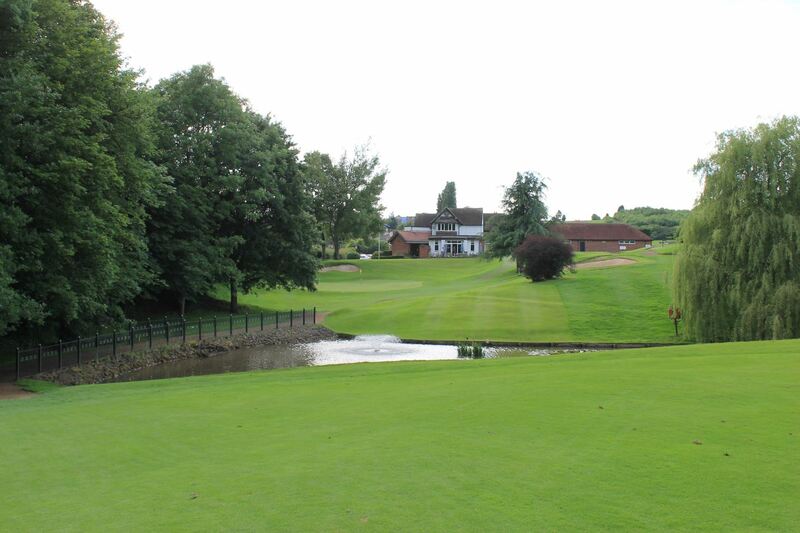 Also to the 16 ladies who are having a two day break playing at Shringley Hall, have a great time. Medal #1 completed, some great scoring even though the course is playing long. With sun forcast for the week let's hope for more run on the ball. It feels like the season has started at last. 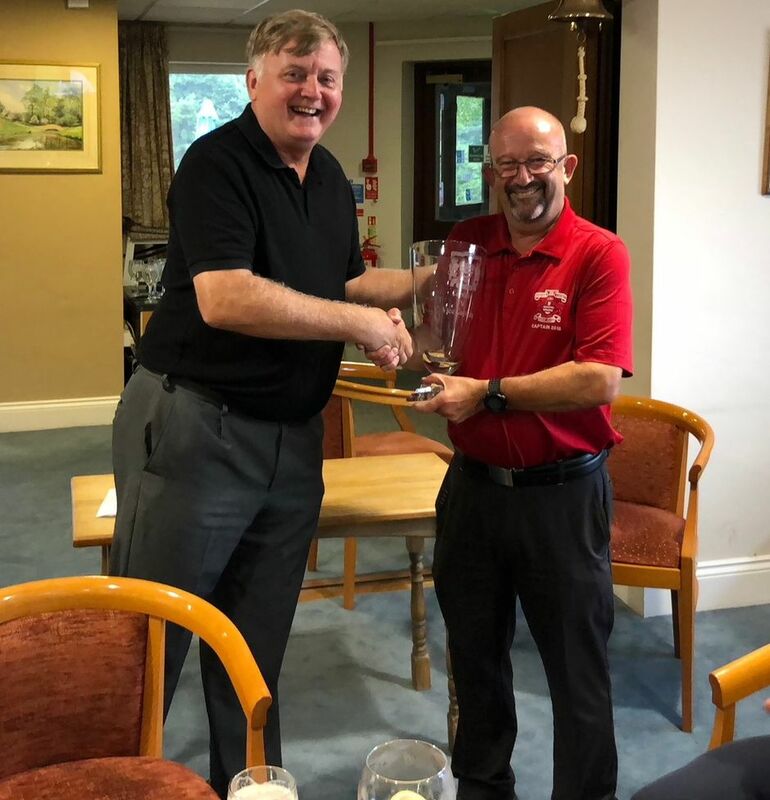 Great day playing in the Old Speckled Hen Golf Competition, the course played well after some serious rainfall the day before (again!!!). Many thanks to the organisers and our catering staff for looking after us so well. Many thanks to all those who helped out in the Seniors Open yesterday, it was a great success. There were some very positive comments about the course and hospitality. Thanks particularly to Gary and Linda for making this a ‘seamless’ event. WHITE TEES for the Timm'sPrize Trophy tomorrow and the SECOND TEE is in play (only off the white tees at the moment). I have had the privilege of playing the first shot off it today, it looks fanatastic. Good luck for tomorrow. 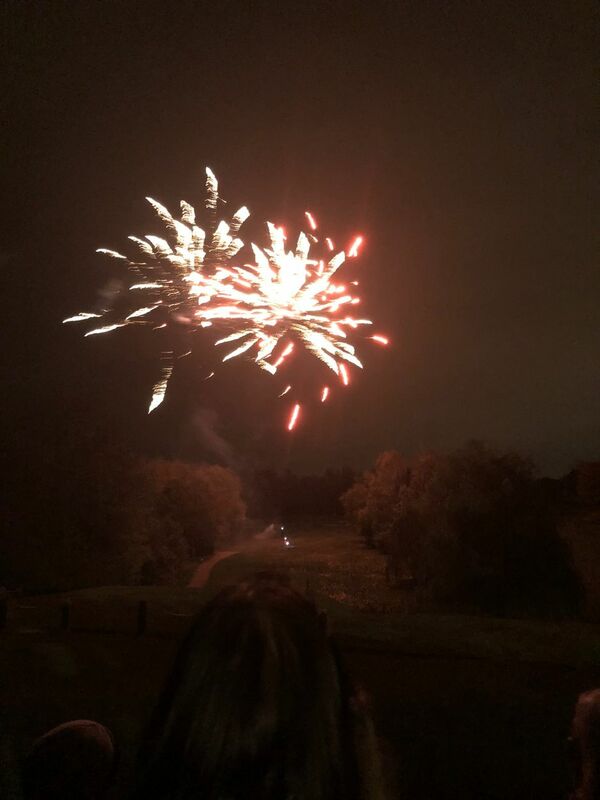 A note from me to thank the Greens Staff and committee members who have worked so hard to present the course in it's best possible condition considering the wet start we have had. I am sure you will all agree that it looks great and now the grass is being cut has good definition. Much work has been done to remove lower branches from the trees both along fairways and around greens, this will help circulate air around the course and allow it to recover more quickly when it is wet. We are fortunate that as a result of work done on the embankment of the A511 by the 18th tee (not by us) the removed trees will allow light to get to the tee, again we are hoping this will improve the quality of the tee. The work done on overgrown areas will help players to locate their ball and speed up play. The old "round pound" stopped being legal tender on Sunday, October 15, 2017. 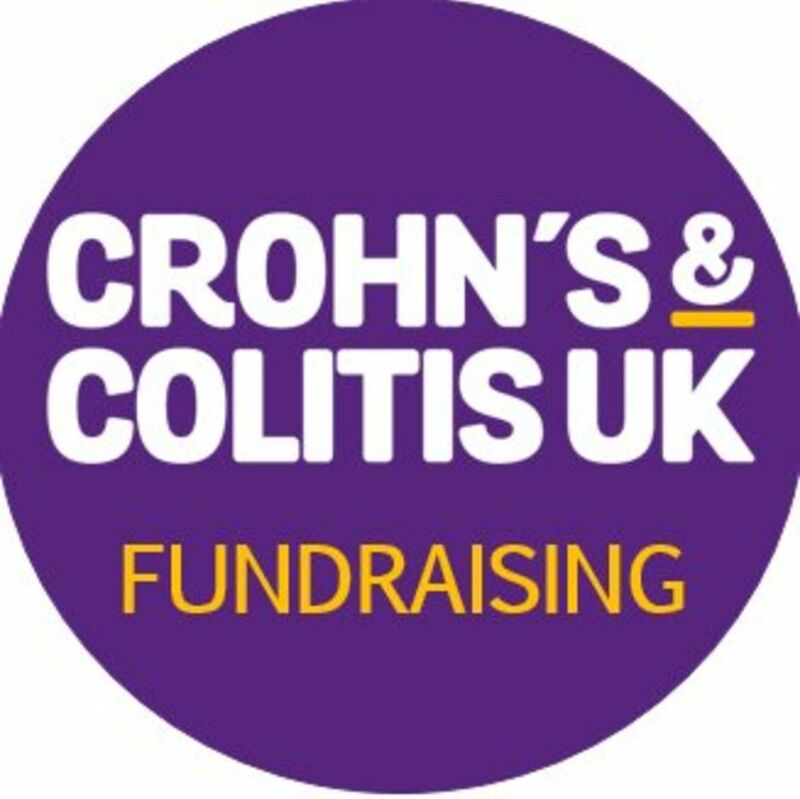 If you still have some why not pay them to the Crohns and Colitis Captain's Charity, just put them in the Charity boxes around the club. All proceeds will go to the Captain's Charity. Many thanks to all those who took part in the Captain's Drive-In today. I would especially like to thank the Greens Staff for making it possible. The winners were David Brightman, Sam Taylor, Ralph Mason and Peter Sumner with a net score of 55.1. 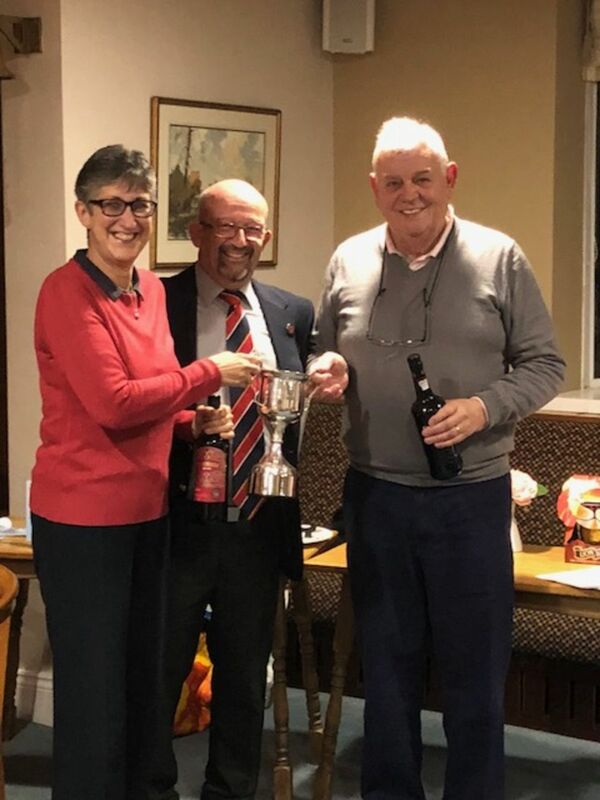 The Winter Social finals took place on Thursday night. The winners, appropriately, were Roger and Moira Jewel with Terry Brown and Ivan Blood runners-up. 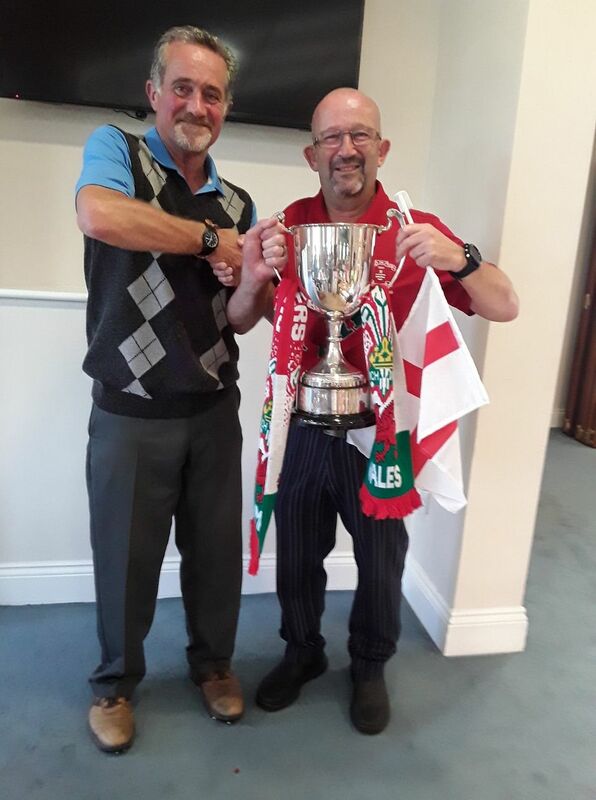 Many thanks to Roger for organising the event and to the players who have frequented the clubhouse even though the weather has not been kind. 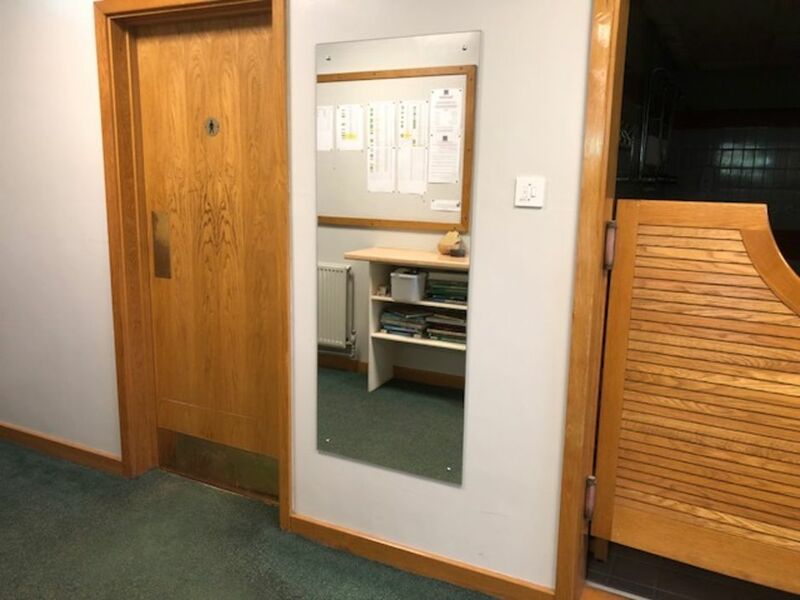 The full length mirror in the gents locker room is up, as promised. Many thanks to House Chairman and staff for putting it up. 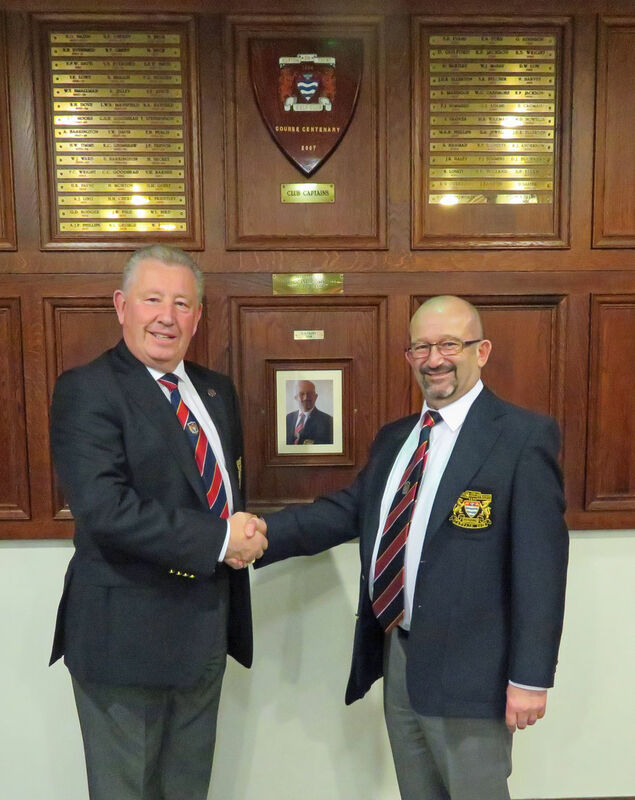 Bob Hamilton and Neil Carter unfortunately lost there Daily Mail Foursomes match against Mickleover, it was close, shaking hands on the 17th green. My thanks go to them for representing the club in this national event. Many thanks to the ladies section who raised £64 towards the Captain’s charity at their pre-season dinner. Many thanks to all those who attended the Ball on Saturday, we just about managed to beat the weather. Great start to the year. You can view photos in the news section of the website. Many thanks to Dave Salter, Brian Humphries and Ken Holland for their help on the night and to Liz and Teresa my wife for organising the event. The night raised £240 towards my charity. The sale of the 2018 calendars raised over £50 for the Captain's Charity, your contributions have been gratefully recieved. The calendars were donated by a member who wishes to remain anoymous, the kind offer has been much appreciated, thanks. 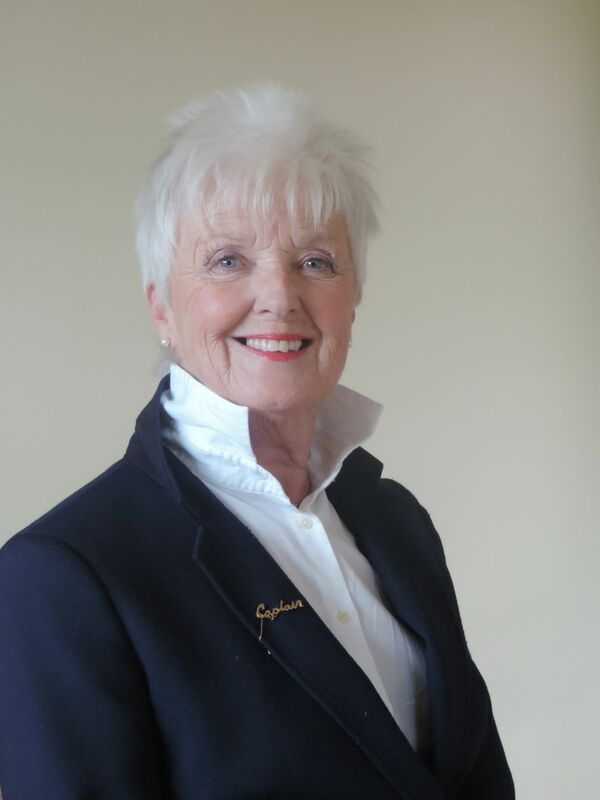 I am very pleased to have Carol Whittingham as Ladie's Captain for 2018, I very much look forward to supporting her and the Ladies section. 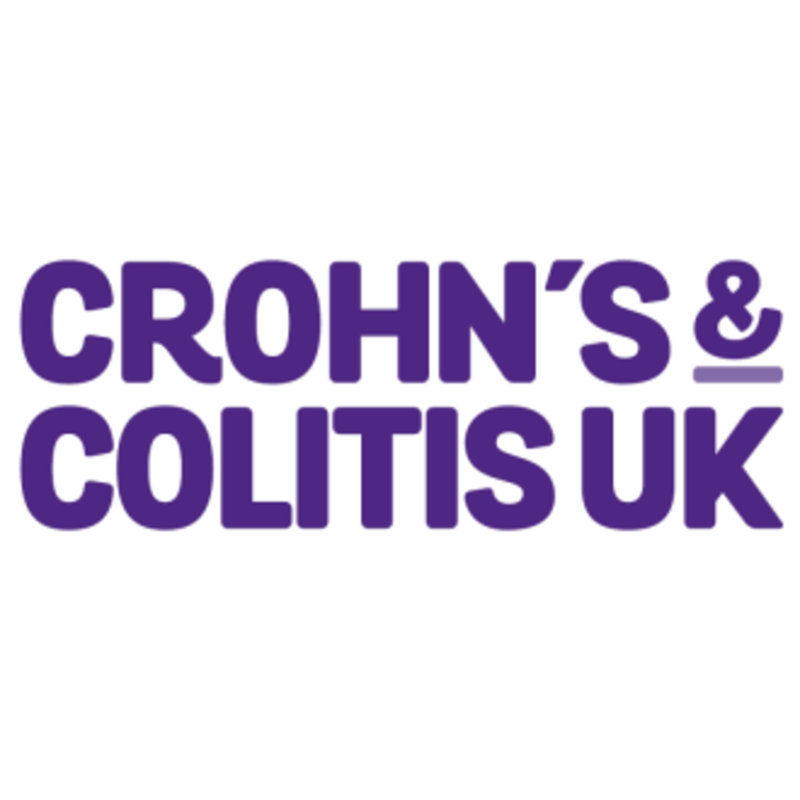 We will both be working for the same charity this year which is Crohn's and Colitis UK.